have butterflies (in the [one's] stomach) (心配で)胸がどきどきする, 上がる. The network topology is usually a butterfly. 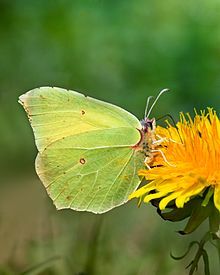 A brimstone butterfly. The word butterfly may have its origins in the name of yellow (または cream-coloured) butterflies such as this. From Middle English buterflie, butturflye, boterflye, from 古期英語 butorflēoge, buttorflēoge, buterflēoge (from butere (“butter”)), equivalent to butter +‎ fly. Cognate with Dutch botervlieg, German Butterfliege (“butterfly”). The name may have originally been applied to butterflies of a yellowish color, and/or reflected a belief that butterflies ate milk and butter (compare German Molkendieb (“butterfly”, literally “whey thief”) and Low German Botterlicker (“butterfly”, literally “butter-licker”)), or that they excreted a butter-like substance (compare Dutch boterschijte (“butterfly”, literally “butter-shitter”)). 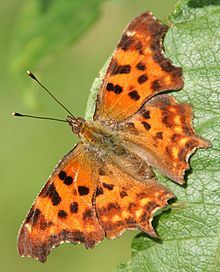 Compare also German Schmetterling from Schmetten (“cream”), German Low German Bottervögel (“butterfly”, literally “butter-fowl”). More at butter, fly. An alternate theory suggests that the first element may have originally been butor- (“beater”), a mutation of bēatan (“to beat”). It is true. I am like a butterfly, and I shall only live a little while. A use of surgical tape, cut into thin strips and placed across an open wound to hold it closed. The day came indeed when her breathless auditors learnt from her in bewilderment that what ailed him was that he was, alas, simply not serious. Maisie wept on Mrs. Wix's bosom after hearing that Sir Claude was a butterfly […]. (transitive) To cut (food) almost entirely in half and spread the halves apart, in a shape suggesting the wings of a butterfly. (transitive) To cut strips of surgical tape or plasters into thin strips, and place across (a gaping wound) to close it. After everyone had obeyed his commands, the lieutenant motioned for two medics that now appeared to enter the room and attend to Dr. Carter. They bandaged him up, butterflying some of the deeper gashes and gave him a couple of shots.